Right now, this feature is only visible to users in the Employee role. If you are an admin or manager and need to submit a request to your supervisor, click here for more info. 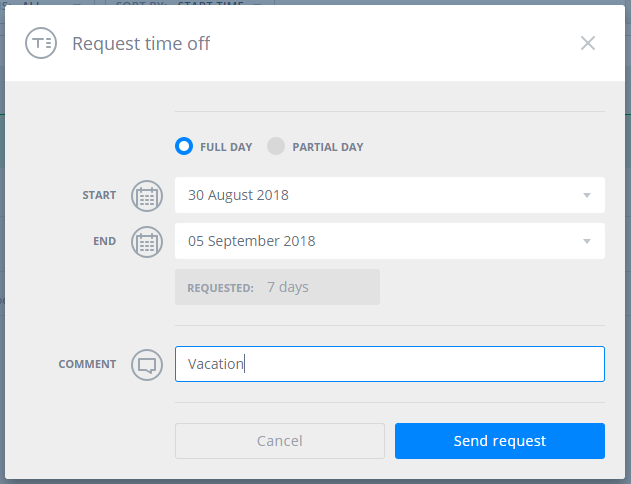 To request time off, go to the Shifts page and click the Request time off button at the top right. Fill in the details of your request and click the Send request button. Your manager(s) will receive a notification of your request and can approve or deny it. If you don't see this option, it's possible your admin or manager has disabled time off requests. Contact them for more help.